You can cross ”swim with the sea cows” off your bucket list. Make the most of your time down south and get up close and personal with manatees at the Crystal River National Wildlife Refuge. Crystal River, called the manatee capital of the world thanks to the city’s large number of warm springs, sits less than two hours north of St. Petersburg. 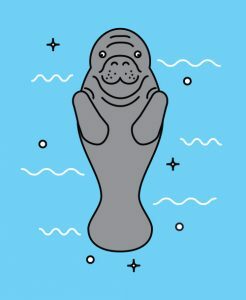 The wildlife refuge is the only one created specifically for the protection of the Florida Manatee, which is threatened largely due to the destruction of coastal habitats. It’s also the only place in the country that lets people swim with these gentle giants, and there are multiple ways visitors can do so: from land, stand-up paddle boarding, kayaking, snorkeling, and scuba diving. Visitors can also take a guided tour to learn about the refuge’s mission. That’s what I call a great reason to get in the water.